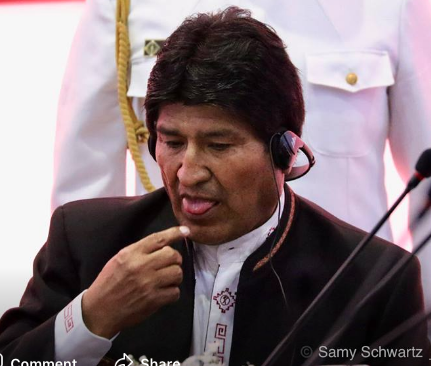 Given the wave of corruption and drug trafficking complaints that affect the government, President Evo Morales has responded in the usual way: accusing the US embassy in Bolivia. With this statement it seems that the President is upset by the complaints, not by the cases themselves. What President Morales is pointing out with these reactions is that he will not accept that these accusations continue to be propelled, instead of trying to prevent them from being carried out. It seems that the Government does not worry that these irregularities are as frequent as the fact that they are made public. On the other hand, the irregularities known in recent months and weeks (gives the impression that corruption was reported per day) were disseminated due to various reasons. On the one hand, thanks to the work of some independent media (for example, Pagina Siete was the first to report prominently on the embezzlement of Banco Union and the irregularities in Entel). On the other hand, there are different official factions involved who make the complaints (as apparently happened with the National Health Fund). In other occasions, some specialists give valuable information (this is the case of YPFB and the purchase of drills). In short, there may be different ways that allow you to report on these facts, which then social networks disseminate massively. It could be a review of the scandals of the last three months and it is possible that its dissemination is not related to the US embassy. The government, which seems to be cornered with so many syndicates, that even the citizenship can not prosecute due to its high number, tries to find a scapegoat at this juncture. The problem facing the ruling party is that citizens see corruption as the biggest problem in the country and, obviously, the authorities. It does not associate it with any diplomatic legation but with the bad behavior of state officials who no longer have a limit. The government must understand that diplomats have functions that are known and fulfilled throughout the world and that although the US has been the foreman in these countries in the past, it is obvious that its current relevance in Bolivia is less. Blaming its representative for structural and political problems is useless and naïve. Bolivian Thoughts opinion: This editorial points out clearly, Bolivia is moving towards a de-facto dictatorship, the delusional egomaniac will do anything to remain in power.